Attention Women Who Are Ready To Re-Connect With Their DREAMS! You've spent too many years caring for everyone else; but have forgotten one person.... YOU! Learn the FIVE STEPS TO LIVE MORE FULLY FROM YOUR HEART! Re-Claim Your Power take back your life! You’re not alone! 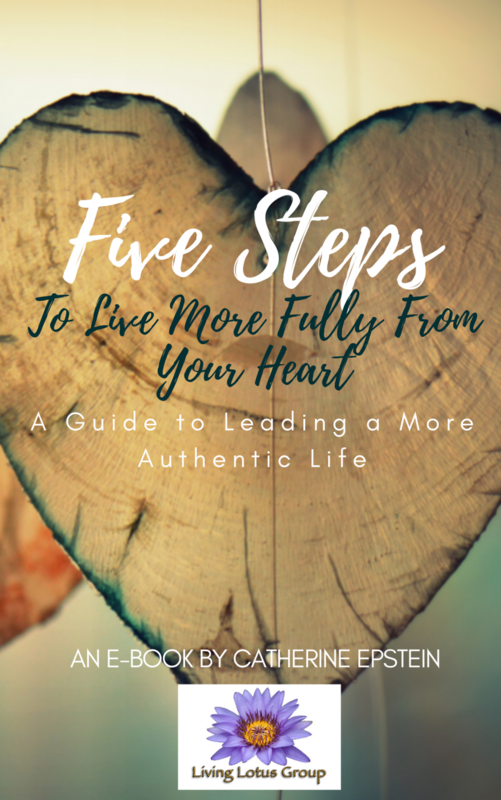 I’ve helped so many women like you to easily TRANSFORM THEIR LIVES with the simple strategies revealed in this Free Guide: FIVE STEPS TO LIVE MORE FULLY FROM YOUR HEART! Submit your name in the form to the right and you'll receive this Special Report ... PLUS some more surprises to help you quickly get started! Cheryl~ "Thank you for our session last night, it was very POWERFUL!" "My session with Catherine was nothing short of spectacular! Her gentle method of guiding me through one of the most powerful sessions that I have ever experienced was deeply healing and much more than I could have expected over the 60 minutes we shared together. I highly recommend booking a session with Catherine if you’re ready to release years of blocked/locked trauma. Her work is masterful!" Julie~ "I gained clarity and together we created a plan to get me un-stuck so I could move forward!" "My experience working with Cathy has been life altering~ Our sessions helped me to clarify and target my "stuck places." With her Guidance and Support, Cathy mapped out the ways to help me move my life forward." Maureen~ "I went from living on auto-pilot to consciously creating my life." "Life coaching with Cathy has been Transformative. Wherever you are is where you start. Cathy listens and you collaborate on moving forward, taking steps to make small significant changes that over time add up or, if you re ready, big changes that make a big difference pretty quickly. Its work, but really rewarding work." Kathy ~ "I left a soul-sucking corporate job that I had for 26 years!" "Like most people, it’s hard to give up a decent income. I felt very lost and confused; something inside of me was screaming for a more balanced and fulfilling life. My first life coaching experience was in late June, 2015. I immediately gravitated to Cathie’s warmth, friendliness, compassion and knowledge. She listened intently to my “story” for the next several meetings, as I took a “real time” look at my personal and professional goals. Shortly thereafter, I began to shift my perspective, and was gaining new clarity. Within a few months, I was on my way to a new career path that Cathie “threw out there” for me to consider. I did my research, and I said “yes” to the universe!"